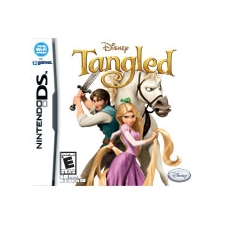 Take on a fun-filled storybook comedy adventure in Disney Tangled for Nintendo DS! In this visually entertaining journey inspired by the animated film, you will explore familiar environments, take on engaging quests and play a host of mini games along the way. Discover multiple activities, rejuvenate and nurture characters in need, befriend animals and ensure that adventurous Rapunzel aided by the swashbuckling Flynn overcomes challenging escapades to untangle her dreams.